Previously we informed you that Esmaeil Bakhshi, the beloved and well-known leader of sugar cane workers of Haft Tapeh in Ahvaz, Iran, in an open letter talked about the harsh tortures that he was subjected to during his prison period and asked Alavi, the minister of intelligence to participate in a live debate and answer his questions about the reasons behind these tortures. 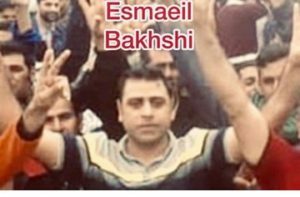 Esmaeil Bakhshi was arrested on 18th November 2018 and spent 25 days in custody. He exposed torture, humiliation, sleep deprivation, insults, and spying on his personal life (listening to his private conversations with his wife). Sepideh Gholiyan and Asal Mohamadi, two student activists who attended the protests as citizen journalists were also arrested and later released on bail. They, too, have spoken about the tortures and have said that they witnessed torture of Mr. Esmail Bakhshi. They are prepared to testify in a public hearing. Esmaeil Bakhshi is under steady pressure by intelligent authorities to deny his claims about the tortures otherwise will be arrested again and put in same conditions, his lawyer says. He needs your support. He is being threatened to more prison time if he refuses to deny the claim. In the past two weeks, since he published the open letter, Esmaeil Bakhshi has been a target of defamation by senior authorities and Islamic Republic media. We call on you workers and workers’ organisations to protest these treatments against Mr Esmaeil Bakhshi and campaign against the systematic pressure on him. Islamic Republic of Iran arrested and tortured a worker who demanded some legitimate and basic rights such as getting paid on time for work and having job security and demanding the right to livelihood for workers, and now the regime wants to silence him by threats and pressure. We, the workers, workers’ unions and organisations across the world must not tolerate such abuse. Esmaeil Bakhshi’s letter (see below) has been welcomed and endorsed by many in Iran. Many have joined campaign of “I have been tortured too” and “we are all Esmaeil Bakhshi” (#من_هم_شکنجه_شدم) to demand answers from the authorities. Under pressure of the campaigns the authorities announced that they would investigate but on tuesday 8 January, the head of the National Security and Foreign Policy Committee of Iran’s Islamic Assembly, Heshmatollah Falahatpisheh, claimed that Esmaeil Bakhshi invloved in some “fights and clashes” with arresting officers on the way to prison and that he was not tortured. Heshmatollah Falahatpisheh, claimed that Esmaeil Bakhshi “confessed” to being “affiliated to the Worker-communist Party” of Iran, that has been denied by the party. The authorities are trying to make a new case against Esmaeil Bakhshi to justify the torture and to pass on a heavy sentence against him for being a member of an opposition political party, which is considered a “crime” and “act against national security” in Islamic Republic of Iran. “Free Them Now” Campaign to Free Jailed Workers in Iran calls on all international workers’ and humanitarian organisations to wholeheartedly and urgently support Esmaeil Bakhshi and show their solidarity with him and Haft Tapeh workers.. Immediate end to securitisation of workers and teachers protests and activities.